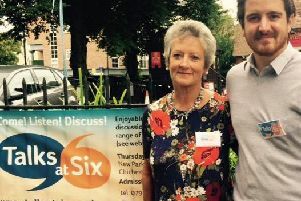 A busy programme lies ahead in Chichester’s popular Talks at Six series, held at The Studio, New Park Centre, Chichester (unless otherwise stated), between 6pm and 7pm, starting as part of the Festival of Chichester. Thursday June 21 – Darwin from Origins to DNA by Craig Gershater will go from the Origin of the Species to modern day molecular and synthetic biology. Meeting House, Priory Road, Chichester. Saturday, June 30 – An Evening with Kate Mosse. Kate will talk about her writing and her new book The Burning Chambers. The Jubilee Hall, New Park Centre. Thursday, July 5 – Prisoners of Portchester by Paul Chamberlain on the life of the 7,000 Napoleonic prisoners held at the castle. Thursday, July 26 – Alan Brooke – Overlooked by Peter Rice, on the most important soldier in WWII, Churchill’s right-hand man and a great leader in the defeat of the Axis powers. Thursday, August 2 – Scam Awareness by Richard Moorey. This presentation about scams, rogue traders, courier, computer and investment fraud will help us be more aware of how easy it is to be a victim of fraud. Thursday, August 9 – Feel your way to Art by Heather Bowring, tells the stories, images and voices of the remarkable people shown in the tactile relief work portrait collection I am not who you think I am. Thursday, Sept 6 – Brexit: the Challenges for Britain by Richard Ashworth MEP. Richard will keep his audience up to date with the negotiations in Brussels and what it will mean for us. Thursday, Sept 20 – Dream Build by Sarah Mansell, the lead fundraiser for St Wilfrid’s Dream Building at Bosham will show the progress and facilities at the new site. Dawn Gracie will sing. At Meeting House, Priory Road, Chichester. Thursday, Sept 27 – Rebuilding a Hawker Typhoon by Sam Worthington Leese who is working on this project. He will offer the history and process of restoring such a flying icon. Thursday, October 4 – Women make Music by Angela Zanders who will explore the names of female composers of classical music, few of whom are known today. She will play extracts on the piano of the beautiful but sadly-neglected works. Thursday, October 11 – Notes from Arts Studio by Philip Jackson. Philip will talk about his life in sculpture, his commissions around the world and the process of idea to final work. His studio is local and his works on display in Chichester. Thursday, October 18 – From Olympic Games to Caring. Christina Bassadone, the two-times Olympic sailor, will talk about her Olympic experiences in Athens and Beijing and her award-winning business caring in the community and beyond. Thursday, Nov 1 – Think before you Throw. Rachel Carruthers from West Sussex Waste will help understand the logic of recycling and how our county goes about keeping the environment clear of damaging waste and plastics. Thursday, Nov 8 – Lest we Forget: Figurative WWI WAR Memorials by Paul Devonshire. Scattered all over the country the memorials are works of art representing the wide range of reactions to the war. Thursday, Nov 15 – It’s a Balloon World After All by Rob Driscoll who will demonstrate some of the things that can be done with balloons and show that they are not just a simple children’s toy or party trick. Thursday, Nov 29 – Hidden Chichester by Andrew Berriman. How well do you know Chichester? How many of these fifty somewhat unusual sights can you identify Andrew will show you the Chichester you have missed.